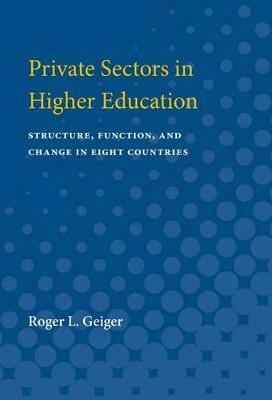 Private Sectors in Higher Education examines how the tasks of higher education have been divided between public and private institutions, and with what consequences. In doing so, the author analyzes both the comparative structures of educational systems and their social relations. Besides correcting the widespread misperception that private higher education is predominately an American phenomenon, this study should enlarge the range of experience that can be brought to bear on issues currently facing public policy and private higher education. It constitutes the first scholarly treatment of private higher education outside the United States. Case studies of private sectors in seven countries--Belgium, France, Great Britain, Japan, the Netherlands, the Philippines, and Sweden--form the core of this work. This material provides a perspective for probing several underlying rationales for private higher education in the United States. And finally, the author analyzes the issue of government financial support for private higher education. This book should significantly contribute to enlarging the framework of discussion of this question by broadening the understanding of the social and political underpinnings of public/private division in higher education.